The BenQ SW240 is a new mid-range monitor, which is specifically aimed at photographers and videographers. It’s also aimed at those looking for a good all-round monitor, to either use as a primary display or a secondary screen. It is a 24.1-inch monitor, offering 1920 x 1200 resolution. It boasts colour accuracy through IPS technology, with 99% Adobe RGB and 100% sRGB colour space. At the time of writing, it retails for around £400, placing it in the mid-range price section for monitors – particularly those of which appeal to photographers. At 24.1-inches, the SW240 is a good size option for those looking for something much larger than a standard laptop screen, but perhaps don’t have a huge amount of desk space to work with. It is a slim and stylish monitor, looking smart on a desktop. Setting up the monitor is very simple – instructions come in the box on how you can attach the stand to the back of the monitor, but you don’t require any specialist tools, everything is very straightforward. Once you’ve got the monitor set up on the stand, simply plug the mains cable into the back of the screen and you’re good to go. A set of different input cables come with the SW240 – there’s a USB, DP to mini DP and DVI-DL cables. There’s no USB-C cable here, which owners of the newer MacBook Pros should be aware of – you’ll need to buy one separately. A detachable shading hood is also available to buy separately – unlike with the more expensive SW271, you don’t get one in the box. You may find you need one of those if your desk / monitor happens to be pointing towards a strong source of light, such as a large window, or perhaps in a studio setting, so it’s worth considering if that’s the case. The screen itself is very sleek – with a very slim bezel around the screen producing an almost edgeless design. The display area measures 518.4 x 324.0mm. Additionally, the screen itself is also not very thick, again being useful if you’re working with a relatively small workspace. From the stand, you can raise the monitor up and down, tilt it forwards and backwards and even rotate it 180 degrees – the latter option can be useful when viewing portrait-format imagery. A wide viewing angle of 178 degrees ensures that you can see the screen from a variety of different viewing angles, displaying the same level of brightness no matter where you look at it from. Along the bottom of the screen is a row of seven physical buttons, the most prominent of which is the on/off button, which is illuminated by an LCD. The other buttons can be used to adjust various settings offered by the screen. The button on the far left is the “Color Mode HotKey”, which means that pressing it will enable you to switch between Adobe RGB, sRGB and Black and White just that singular button. Pressing any of the other buttons will bring up the on-screen main menu, with each button then corresponding with the icon you see just about it. From left to right, there’s the input button, which you can use if you’ve got more than one source for the screen – for example a laptop and a table. The second option is for adjusting the screen brightness – press it and then use the buttons to move the slider up and down to your required brightness level. The third button is for adjusting contrast, again, use the buttons to adjust the slider to the contrast level you require. The fourth button brings up a more extensive menu, where you’ll find options such as Colour Adjustment and System. For example, you could add other modes to the Color Mode Hot Key, or change the order of how the other keys work. Finally, the fifth button is used simply to exit the menu panel when you’re done making your changes. If you don’t touch any of the buttons for a while, you’ll also exit the menu automatically. You will find USB slots and an SD card slot to the side of the monitor, at the back. They’re a little bit awkwardly placed for easy reach, but it could be a good option for keeping a spare phone charger or something similar permanently plugged in. It seems relatively unlikely that you’d need to use the SD card slot if you’re working with a computer, but it’s good to have the option there should you need to access some files. Factory calibration is included as standard with this monitor, meaning you can use it directly out of the box if you wish to. A calibration report is included which you can refer to if you want to change the setup to suit your particular needs. You’re also able to download BenQ’s “palette master” software, which allows you to calibrate the screen in conjunction with a colorimeter (sold separately) to meet your own settings. You could easily be forgiven for thinking that the BenQ SW240 is more expensive than it is, putting in an excellent performance directly from the box. Although it is not 4K, the level of detail rendered is very good and should be more than enough for most enthusiast photographers – videographers working in 4K may wish to look elsewhere, though. The monitor is very bright, while the 10-bit display ensures that colour gradations are very smooth. Colours themselves are well-rendered and vibrant, while maintaining a good degree of realism (at the factory calibration setting). With a refresh rate of 60Hz, this is a slightly lower specification than some of the higher-end, more expensive models currently on the market. For the price though, this is to be expected, and again, should suit the needs of the average enthusiast photographer well enough. 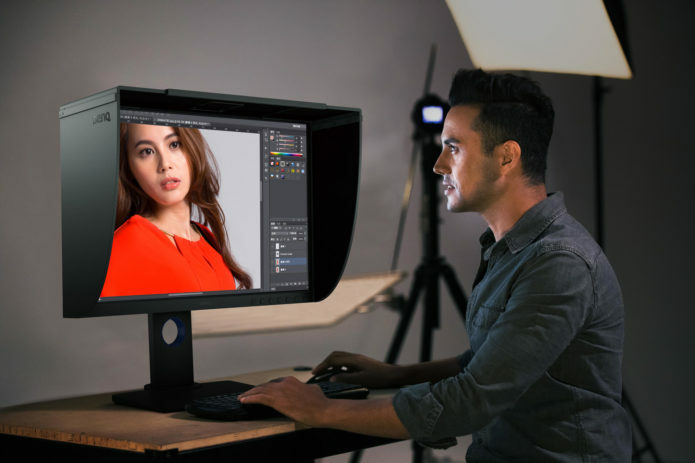 Monitors designed with photographers in mind can be extremely expensive, sometimes offering sizes which are too large for your workspace, or perhaps a little over the top for somebody who considers photography a hobby (rather than a profession). 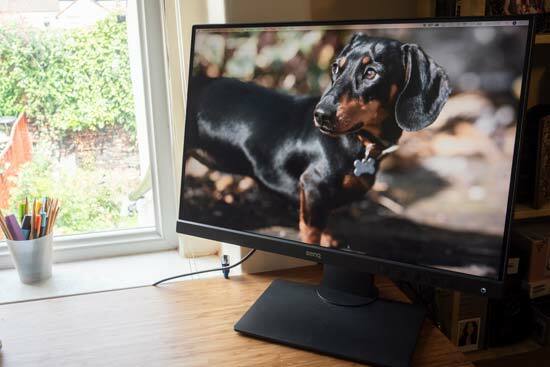 Here with the BenQ SW240, there’s something which sits in the middle range of monitors offering a good all-round option for those who want to use the monitor for their photography needs, but also works well as a general-purpose monitor. While 24-inches is smaller than some of the more professional or expensive monitors on the market, it’s still much larger than the average laptop screen and is a great size for looking at your photographs. The frameless design is popular among monitors and creates a clean and sleek finish, giving you the maximum amount of workspace for the monitor’s physical size. There’s a decent range of connectors included, but those working with a newer MacBook Pro will need to be aware that a USB-C connector is not included as standard. Also worth noting is the fact that a shading hood needs to be bought separately – this shouldn’t be a problem for the average photographer, but anyone hoping to use it in perhaps a studio setting may want to consider spending a little more to upgrade. Having the ability to move the screen around into a number of different positions is great – especially for photographers who do a lot of portrait (format) work. The supplied stand is also a great option for moving the screen up and down, or tilting it forward and back depending on your preferred viewing position. 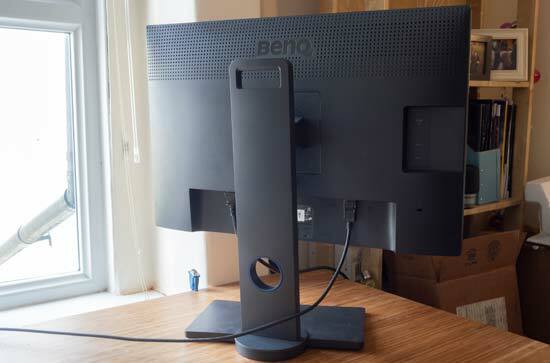 Overall, the BenQ SW240 is a great choice for photographers who want to invest in a decent monitor, but don’t have a huge budget to work with. If you’re a videographer, you may want to consider the SW271, which is more expensive, but offers 4K resolution (and a bigger screen).